Well I went to Caribfest in Barrie for the first time on Saturday and I had a ball. Not knowing what to expect, I took what was left of my Caribana costume and some limin' clothes as well - just in case. Got there and immediately parked (free) at the end of the parade route (Lakeshore Dr), got costume on and some liquid stimulation ready and headed up to the starting line. There were only a handful of Caribana bands from Toronto there - from what I recall: Saldenah, Carnival Nationz & Fantasia. While enroute, looked like Nationz and Saldenah joined forces and looked huge together in comparison. Like Hamilton, it was a free for all - jump with whichever band. Like most things in life, the best part was at the end. The lime on Lakeshore Dr with an open area on the lake front was perfect. There was a stage for the bands and performers, the usual array of food and craft vendors. People were even going for a swim or a simple cool-down dip. By the way, the body of water you see there is actually called Kempelfelt Bay which connects with Lake Simcoe.... yes it's cleaner than Lake Ontario. I took Hwy-10 north to Hwy-89 then Hwy-27 to get up to Barrie. As a 905er (Brampton), this was definitely faster than trying to connect with the clogged Hwy-400 at about 10am on a Saturday morning. For all those ppl that choose Hwy-400 and swore at the traffic all the way up, I emphatize with y'all. Planing is everything on a road trip. Unfortunately, I didn't make it to Barrie but from your description its sounds like a rell nice lime!!! 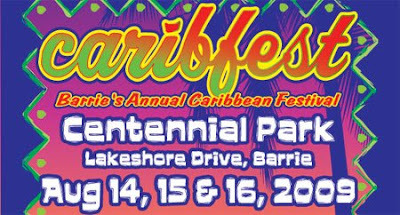 I am going to try my best to make it out to Caribfest for 2010. Thanks for sharing your experience.....I appreciate you taking the time to comment!! Yeah, I went up to Barrie too and avoided Hwy-400 also. Caribfest was certainly great to attend - first time. I showed up with the pieces of my costume on and ready to party. Speaking to a Caribana band leader who was there as an on-looker; he said that what they were offering him ($$$) to bring his band to Barrie wasn't worth it. He was also not surprised that Nationz and Saldenah merged in the parade.... things that make you go Hhmmmm. I limed on the waterfront until about 10pm - that was priceless. Despite the ongoing construction on Lakeshore Dr, it is a beautiful space. I am guessing that free parking won't last once someone at Barrie city hall notices. I predict Caribfest in Barrie to be that emerging horse in the race.